We started off with shopping at a supermarket next to Leo's place. He was going from one shelf to other, figuring out what was available and putting together the dinner menu in his head. "Good, they have the peppers, but leafy celery is not good... Do you mind if we have Pasta fagioli and lasagna?" Obviously I was perfectly fine - would you mind? We moved to diary shelves. "Do they have tvorog?" - it was turning out that Leo is localized to a very high extent. Not only he doesn't mind substituting ricotta for Russian cottage cheese, he even calls it by its Russian name. The most interesting thing happened at the cashiers though, when Leo met a 18-year-old Mexican girl, who turned out to be a ballerina at Bolshoy theater. I'm going to stop here, but you might try to get more details from Leo himself. Cooking started from tomato sauce. Leo said he doesn't really like that most classical Italian tomato sauce, which is boiled for hours. His favorite one is cooked for around 20 minutes - with lots of garlic, basil, rosemary and red wine. I was trying hard to keep track of what and how he was doing. However as we started drinking red wine before cooking I lost most of the details, so Leo had to help me later on to write the recipes down properly. You will find them below in all their beauty. While shopping we got quite a lot of simple green bell peppers. Leo meant them for peperonata. "These are almost not edible as they are. But they work just beautifully in peperonata." We also got a pack of feta cheese. It was meant for spinach and cheese lasagna (together with the cottage cheese). "I know it's not traditional, but it tastes great" - I have to say, it did. Mid way in our cooking Natalia came home and joined. I loved watching them cooking together. Leo was making food in a very intuitive way, measuring everything by eye, tasting, adding something - "it's about love". Natalia was literally dancing around the kitchen while helping him. Do I need to say that everything tasted completely fabulous? First course was pasta fagioli - a very homey and comforting soup with white beans and short pasta. "That's where the pasta should be very soft and not al dente". To me it is a perfect winter soup, which is already getting introduced into my home cooking and competing with my best loved red lentils soup. Spinach and cheese lasagna doesn't need any introduction and it was indeed beautiful with feta cheese and with Leo's lovely tomato sauce. Peperonata I tried for the first time and I loved the whole idea of it. Strips of peppers are sauteed in olive oil with some onion "until limp and almost burning". You "scrape the bottom of the pan to get the burnt bits off" and the sauce turns brown and delicious. There you go with these three recipes. Leo said he got to know twenty or so from his grand mother in total. I'm very much hoping to find out other seventeen in the nearest future. I also asked Leo and Natalia about their favorite Italian restaurants in Moscow. They listed Il forno and Aromi la bottega (some time ago I got to watch a master class of its chef, Pietro Rongoni about making sea bass in gorgonzola sauce). Both went straight in my to go list. Heat 2-3 table spoons of olive oil in a medium saucepan. Sautee the onion till it is transluscent. Add the celery stick, then tomato and celery leaves. Season with salt and sautee for around 5 more minutes, till the vegetables are soft. Add the beans and around 1.5 liters of water. Give it a stir, bring to the boil and add pasta. Bring back to boil and cook a couple of minutes beyond al dente. Serve hot, topped with grated parmesan. We used it for lasagna, but it can go on anything and can also can be used a base for other more complex sauces. You can jar it and save for later. Heat 2-3 table spoons of olive oil in a medium pan. Lightly fry the garlic and basil leaves for 30 seconds, stirring. Add the tomatoes (with juice), red wine, season with chilli, rosemary, salt, pepper and sugar. halve the tomatoes using a wooden spoon or fork. Cook for 20 minutes. Puree the sauce in a blender and transfer back to the pan. Reheat and add the parsley. Take off the heat and let it stand for a few minutes for the parsley to wilt. Fry the onion in 2 table spoons of olive oil till it is translucent. Add spinach and cook till it unfreezes. Take off the heat. Mix in ricotta, feta cheese and eggs. Season with salt, pepper and chilli. To make the bechamel melt the butter in a medium heavy based pan on medium low heat. Add the flour and cook for 2-3 minutes stirring till it gets ivory color. Take the pan off the heat and let cool for half a minute (to prevent the lumps). Pour in the milk and whisk till the flour dissolves into it. Return the pan to low heat and cook whisking constantly for some 5 minutes till the sauce thickens. Add the nutmeg and salt to taste. See the step by step pictures of bechamel making in the post about Broccoli and Brie cheese gratin. Layer the lasagna. Pick a rectangular baking dish around 20 by 30 cm. Laddle in tomato sauce to get around 1 cm layer. Add a layer of dry lasagna sheets. 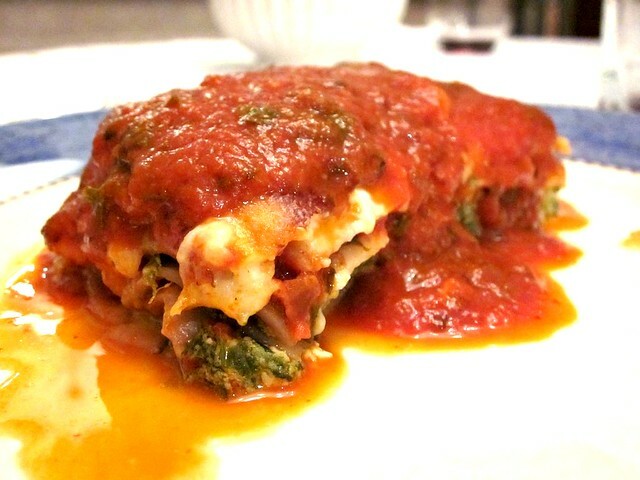 Spoon some spinach paste on lasagna sheets and spread it to get it around 1 cm thick. Add another pasta layer and spinach layer. Repeat once more and finish with pasta layer (you should get 4 layers of pasta and 3 layers of spinach in total). Pour the bechamel over, spreading it evenly. Bake the lasagna at 180C till it is golden on top and easy to pierce in the middle. It should take 25-30 minutes. Serve topped with more tomato sauce. In a large pan heat the oil, add onions, peppers and salt. Cook stirring on medium-high heat till the peppers cook down. Keep frying until the peppers start almost burning on the bottom of the pan. Keep stirring and scraping the bottom of the pan to get the burnt bits off, till the peppers turn very soft and acquire a browned sauce. Serve hot, topped with parmesan. Must be the mediterranian weather & lifestyle... my mom's turkish and she cooks something that looks(and has the same contents) as the peperonata, just with a different name. Also we do the lasagne, though we use turkish white cheeses instead of ricotta. Love the images, really yummy! Thank you so much! Oh, that's interesting that in Turkey there are dishes so similar.